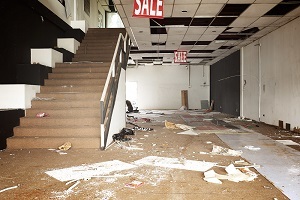 Filing Insurance Claims for Fire Damage to a Shopping Mall | The Voss Law Firm, P.C. Shopping centers can be highly profitable endeavors, but they also come with a variety of safety concerns and legal responsibilities. One of the biggest requirements in operating a shopping center is to protect the business and structures with coverage against fires. However, this coverage may not be as comprehensive as you thought. Attorney Bill Voss takes a look at common options on commercial fire insurance policies and how insurers may attempt to deny coverage for certain losses. A single spark can bring down even the most bustling of commercial locations, and insurance settlements are often the only thing that stands between repairs and shutting the doors for good. While no business owner would neglect to buy some form of coverage, not all policies are created equal. Many owners opt for the convenience of a business owner’s policy (BOP) to cover legal injury liability as well as property damage. These insurance plans are often custom-made with a variety of options, and it is up to the owner to select additional coverage. Contents coverage. Some insurers provide coverage for an entire property, while some take an “a la carte” approach. An owner who assumes his buildings and structures coverage will pay for the full costs of repair may be shocked to discover a contents clause excluding the contents of the building from coverage. Business income coverage. While it may be obvious that owners will need to relocate their businesses to stay open during repairs, business income and expenses coverage is not standard on many commercial policies. Business auto coverage. From smoke damage to vehicles in your parking lot to paint damage on your company car, this coverage will pay to restore your commercial vehicles to working order. Umbrella insurance. Just as a fire can spread quickly between shops, a total loss fire can quickly exceed the limits of your policy. Umbrella insurance provides coverage for a severe incident that require extra coverage. This coverage can be invaluable for owners who rent to tenants (such as restaurants or nail salons) that increase the risk of fire. If you and your insurer have different views on what should be covered under your fire damage policy, we can help. Simply fill out the form on this page today to contact the Voss Law Firm or order a free copy of our book, Commercial Property Owners Must Read This BEFORE Filing an Insurance Claim. What can be done to speed up the insurance claim process?